A perfect Flaky Pie Crust Recipe made from scratch produces a crust that is tender, tasty, and flaky, not soggy or greasy. Old fashioned recipes, made from scratch, handed down from generation to generation, used only flour, salt, fat and liquid. Mama's 1935 November issue of Good Housekeeping contained a crust recipe that listed 2 cups of "cake" flour. That same recipe was published in my first cookbook in 1963, The American Woman's Cook Book by Ruth Berolzheimer, Director of Culinary Arts Institute. The only difference in the ingredients list was that my book listed "all-purpose flour". This recipe has a more detailed mixing method to help you achieve a perfect crust every time. Do not substitute self-rising flour nor add baking powder or baking soda to the formula. Fat consists of oil, lard, hydrogenated vegetable shortening or butter. Butter gives the best flavor. However, it is not 100% fat and is more susceptible to producing a tough pastry. Lard is the better choice. It is 100% fat, has a more distinct flavor than plastic shortenings and produces a consistent tender, flaky pie crust. Water is the preferred liquid. Milk or the addition of other ingredients such as sugar and eggs can cause the crust to brown prematurely. The addition of lemon juice or vinegar is not recommended because of its high acidity content. 2/3 cup lard which has been chilled in the refrigerator. 3-4 tablespoons ice cold water. Sift together flour and salt into a mixing bowl. Add chilled lard and cut into flour with a pastry blender or two forks, until all fat particles are no larger than small peas. Refrain from using your fingers at this step because they will provide warmth to the lard causing it to become too soft. The best method to get the water into the flour is to sprinkle a tablespoon of water over 1/4 of the flour, mix it in lightly with a fork. Then push the moistened flour to the side of the bowl and do the same with another 1/4 of the flour until all is moistened. Use as little water as possible, but enough for the dough to clump together. How much water you need often depends on the brand of flour you are using. Shape dough into two equally sized balls. Cover and place in the refrigerator 10-15 minutes to allow the dough to hydrate. Remove one ball of dough from the refrigerator at a time. Place it on a pastry cloth or clean, smooth kitchen towel which has been dusted with flour (to prevent it from sticking). Use a pastry cloth cover, dusted with flour on your rolling pin. If you don't have a cloth, sprinkle a little flour on top of the dough ball. Pat dough down with your hands to get a flat surface to start rolling on. Begin in the center of pastry and roll out to the outer edge. Lift pin and start in center again. Roll in opposite other direction. Do this until you have a round circle about 1/8 inch thick and about 1 1/2 inch* larger than the diameter of your pie pan. Roll exercising light pressure. Refrain from rolling back and forth all over dough. It makes it tough. As you roll if it becomes sticky, add only enough flour to prevent this. You can periodically lift the edges as you go to see if it starts to stick to the cloth. If it does, just swipe a little flour on pastry cloth with your hand using as little flour as possible. *The 1 1/2 extra inch is to accommodate the depth of your pie baking pan. If it is deeper than 1 inch roll to the extra measure needed. There are three methods to transport your pastry from the cloth to the pie pan. Choose the one you prefer. Gently roll the crust up on the rolling pin. Carry it to your pie plate and unroll it and center it. Fold you crust in halves or fourths. Lift it up with your hands and place it over your pie pan and unfold, centering crust. Clean excess flour or anything else around pastry cloth. Lay the pie pan upside down in the center of your crust. Place both hands under the cloth and invert the whole thing together. Invert the whole thing together. Remove the cloth. I use the third method because I think it is quicker. It is more accurate in centering the. It also helps prevent excess handling of the dough. In all three methods avoid pulling or stretching the dough when transporting. That could cause the dough to shrink back during cooking the crust. If making a single Flaky Pie Crust, cut excess dough around edge of pan. Flute the edges using your fingers or crimp the outer edge with the tines of a fork. Prick the bottom of crust. Bake in a preheated oven 450F. 12-15 minutes until lightly browned. If making a double Flaky Pie Crust pour your prepared filling into the first crust and place the second crust on top. Trim second crust edges about 1/2 inch larger than diameter of pan. Fold edges of second crust under edges of first crust and flute or crimp around edges to seal. Prick or slit center of crust. Bake according to directions in your recipe. 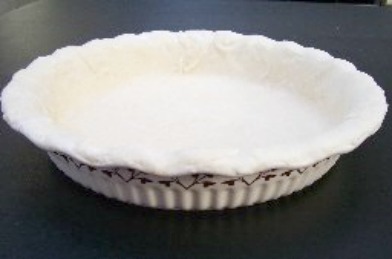 Makes two single or one deep dish 8" or 9" Flaky Pie Crust. Also makes one single 10".